When Israel reclaimed Jerusalem in 1967, it made the hearts of devout Jews skip a beat. Would this be the moment the Temple would be rebuilt? And if so, where would that be? Of course, many Jews said that Jerusalem should be the place, on top of Mount Zion, where the temples of Solomon and Zerubbabel had been. It would be built in the same location that the Temple was destroyed by the heathen nations, Babel and Rome. But why build it in Jerusalem? What is so special about Jerusalem and Mount Zion? What’s unique about this small mountain, 800 meters above sea level, at the edge of the desert? The name Jerusalem, which literally means ‘possession of peace’, appears more than eight hundred times in the Old and New Testament. Other names used for Jerusalem include Ariel, City of God, City of David, City of Judah, Jebus, City of Righteousness, City of Truth, City of the Great King, Holy City, Faithful City, Salem and Zion. Some of these names appear only once, while others appear multiple times. The name Zion, however, appears more than one hundred and fifty times. When Zion is used in the Bible, it speaks of love, passion and intimacy. The Lord has decided to make Jerusalem a dwelling place for His name, meaning that the Eternal God, Creator of heaven and earth has chosen to live there. It is His holy mountain (Isaiah 11:9, 56:7, 65:11, 25; Zephaniah 3:11), Mount Sion (Joel 2:1, 3:17) where God dwelt (Psalm 74:2). The place is also called the house of the God of Jacob (Isaiah 2:3) and the house of the Lord (Ezekiel 8:14, 16; Joel 1:13-14; Micha 4:1-2 and Haggai 1:14). When the Temple in Jerusalem, built by King Solomon, was dedicated, ‘the cloud filled the Temple of the Lord and the priests could not perform their service because of the cloud, for the glory of the Lord (Shekinah) filled His Temple’ (1 Kings 8:10-11). The Shekinah, the glory of the Lord, dwelled in the Temple that was built by Solomon (2 Chronicles 7:1-2). Ezekiel saw the Shekinah, the glory of the Lord, depart from the Temple right before the Babyloniansdestroyed it in Ezekiel 10:18- 19 and in Ezekiel 11:22-23. The glory of the Lord went up from within the city and stopped above the mountain east of it. That mountain is the Mount of Olives. From that direction it will return to the final Temple as the permanent presence of the Lord, the God of Israel, to dwell among His covenant people. Ezekiel also sees how the glory of the Lord returns to the last and final Temple. He describes the future, “There will be one king over all of them, and they will never again be two nations or be divided into two kingdoms.” The mountains of Israel form the heartland of Israel, also called the West Bank. It is not the Lord’s desire for this area to be part of a new Arab-Islamic state with the name Palestine. The ten tribes of Israel and the two tribes of Judah will be united again, just as we see this happen in the return of the Jews from the four corners of the earth, the great Aliyah (Isaiah 43:5-8, Jeremiah 16:14-15). This means that the return of all twelve tribes is happening today, and not just the return of the two tribes who together are called Judah. Not all the people of the ten tribes were deported by the Assyrians, nor were all the people of the two tribes exiled by the Babylonians. Many remained in the land. About ten percent were taken away, the ‘top layer’ of the population. The rest stayed behind to work the land and to bring in taxes for the domineering hostile powers. People from the two tribes and the ten tribes have returned after the seventy years of Babylonian exile between 600 and 500 BC. A few groups have moved further away, including the Bnei Menashe (sons of Manasse), but they too are now coming home. What do we know about the historical location of the Temple? It is certain that Solomon built this Temple in Jerusalem on Mount Moriah. In 2 Chronicles 3:1 it tells us that Solomon began to build the temple of the Lord in Jerusalem on Mount Moriah, where the Lord had appeared to his father David. It was on the threshing floor of Araunah the Jebusite, the place provided by David. Mount Zion and Mount Moriah, the location of the Temple, are the same place. This is the same Mount Moriah where Abraham was willing to sacrifice Isaac to the Lord, but where God gave him a ram to sacrifice instead (Romans 8:32), where the Apostle says that God did not spare His own Son, but gave him as the sacrifice for sin. In Genesis 22:13-14, Abraham looked up and there in a thicket he saw a ram caught by its horns. He went over and took the ram and sacrificed it as a burnt offering instead of his son. So Abraham called that place The Lord Will Provide. This is the mountain that Abraham called, The Lord will Provide and that has remained a saying (Genesis 22:14). Abraham was given what he needed for body, soul and mind. Mount Moriah is Mount Zion, the Temple Mount in the heart of Jerusalem. Grace determines the character of the place of the Temple. It was not a place where people provided for God’s needs, as so many temples of other gods seem to do. It was a place where God provided for the needs of His people (1 Kings 8:31-53). The preparations for the rebuilding of the Temple are fully in progress today by all kinds of Jewishorganisations. Among the Dead Sea Scrolls found in 1951 in the caves of Qumran, there was a copper scroll. According to interpreters, this scroll mentions 64 places where Temple treasures are hidden or buried. 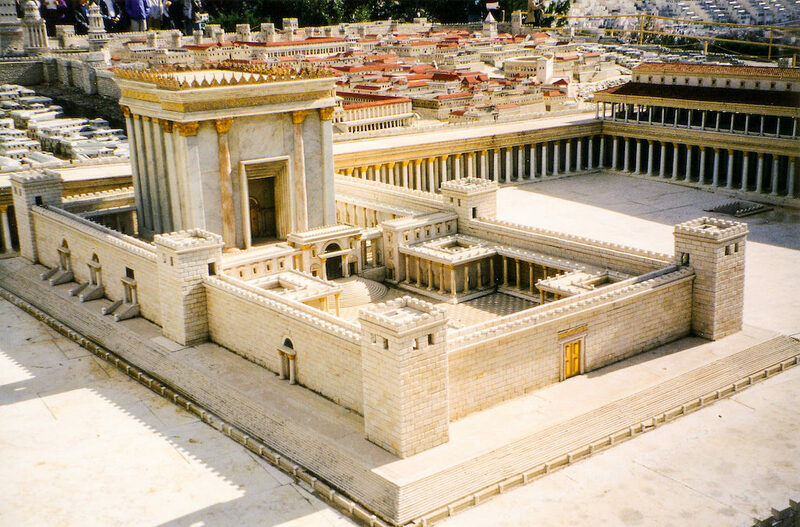 Rabbi Goren believes that objects from the Temple are hidden deep beneath the Temple Mount. Among these treasures, there would even be the Ark of the Covenant that was lost during the destruction of the temple by Nebuchadnezzar in 586 BC. The apostle Paul says in 1 Corinthians 3:16-17, ‘Don’t you know that you yourselves are God’s temple and that God’s Spirit dwells in your midst? If anyone destroys God’s temple, God will destroy that person; for God’s temple is sacred, and you together are that temple.’ Paul almost never mentions the Temple as a building in Jerusalem. What did Paul mean in 2 Thessalonians 2:1-8 when he speaks about the ‘man of lawlessness’ who will sit in the temple? Is it possible that in this case the concept of the Temple relates to the church, as a Christianityruled by anti-christian thinking such as the ‘goddess of reason’ that was worshipped in the Nôtre Dame in Parisduring the French Revolution? This could very well be. This temple/ church/Christianity will then be desecrated very quickly by the man of sin, a human being that wants to be like God. This was the temptation that Satan held out in the first book of the Bible. ‘You will be like God’, he said, ‘When you disobey God’s instructions.’ The last revelation of Satan is in this man of perdition, the antichrist, who puts himself on the throne of God in the temple. You cannot imagine a greater abomination in the holy place than this. But does it necessarily refer to a literal rebuilt temple in which the antichrist will sit? Is that the ‘abomination that causes desolation’ that the Lord Jesus speaks about in Matthew 24? We might not have to wait for a literal Temple to be rebuilt in Jerusalem and then desecrated by the antichrist as a historical figure. Perhaps the ‘abomination that causes desolation’ is already here. Islam dominates the holy place. Jesus did not use the Greek word ναος (naos) for ‘temple’, but he spoke of the ‘holy place’, τοπος αγιος (topos hagios), which could very well be Mount Zion itself, on which the temple was built. Hatred and violence are preached against the Jews (and Christians) in the mosques on Mount Zion, and this could eventually lead to more destruction. This could one day lead to a ‘jihad’ (holy war) against Israel. A war that’s so violent and destructive that Jesus, in His eschatological sermon on the Mount of Olives(Matthew 24), tells the Jews to flee. The desecration of this holy place will cease when the Messiah Himself eventually appears. Then the holy place will be restored again. (Daniel 8:14). Sometimes I think the more people start talking about the rebuilding of the Temple, the closer we get to the return of Christ, the Messiah ben David!